Bringing the game into disrepute was a term used regularly not so long ago by the Football Association, and I think it is about time it was re-introduced. Once again on Saturday, our old nemesis Keith Stroud was the man with the whistle, and once again he blew it for all the WRONG reasons! If you recall in April 2017, Stroud wrongly awarded an indirect free-kick to Burton Albion after Dwight Gayle had encroached into the box, when the rules clearly state that he should have ordered Matt Ritchie to re-take his penalty. Stroud’s personal penalty was a 28-day ban; along with his officials, and the catalogue of errors that have accompanied this dreadful referee has continued unabated ever since. Everton’s Marco Silva lost his cool with him and almost got himself banned, and in his first game back in action after his month ban, he enraged Peterborough supporters with his poor decision-making, and our Vital Posh reporter Mark Lea reminds us why the home fans were so incensed. ‘One incident occurred twice during the match and he followed the rules correctly the first time but not the second! The situation in question relates to when a Posh player fouled a Bantams player. The Posh player received a yellow card while the Bantams player received treatment. Because the Posh player received a card for the foul, the Bantams player didn`t have to leave the field of play. I suppose the only consolation here is that Stroud is consistently bad and it is not just Ipswich Town who are the victims, but as Terry Hunt pointed out in the East Anglian Daily Times today, he is with doubt the worst referee on the books since Welshman Clive Thomas, who in the 1975 FA Cup semi-final replay against West Ham United disallowed two perfectly good goals from Town midfielder Bryan Hamilton, to the astonishment of the Stamford Bridge crowd. Not only did Stroud disallow a perfectly good goal from former Town striker Daryl Murphy, he decided to level things up by mysteriously disallowing that Jon Nolan goal midway through the second half. Not content with that, he turned a blind eye to Town’s late penalty appeal when Kayden Jackson was clearly manhandled in the box and then decided to blow for full time before Ipswich could take a corner. He was also the ref that turned down another stonewall penalty when Collin Quaner’s goal-bound strike was swept off the line by a defender’s trailing arm at Villa Park. I don’t hear the phrase ‘Bringing The Game Into Disrepute’ anymore and yet when it comes to abysmal officiating, this term certainly still applies. First off Im an Ipswich fan & also a referee. The disallowed goal was given by the linesman & not by Stroud, so you cannot blame him for that decision. As for the Nolan goal Stroud had already blown the whistle just before Nolan had struck the ball. Well, Deano, referee or not, I see you have been very selective memory about what happened in this game. Firstly, the referee can, of course, over-rule a linesman and I am quite sure you have done this in your time. Secondly, you do not explain why he ruled out the Daryl Murphy goal – or indeed why he refused Town a penalty against Villa when Quaner’s goal-bound strike was palmed away by a defender’s trailing arm? It was after all the very same referee! 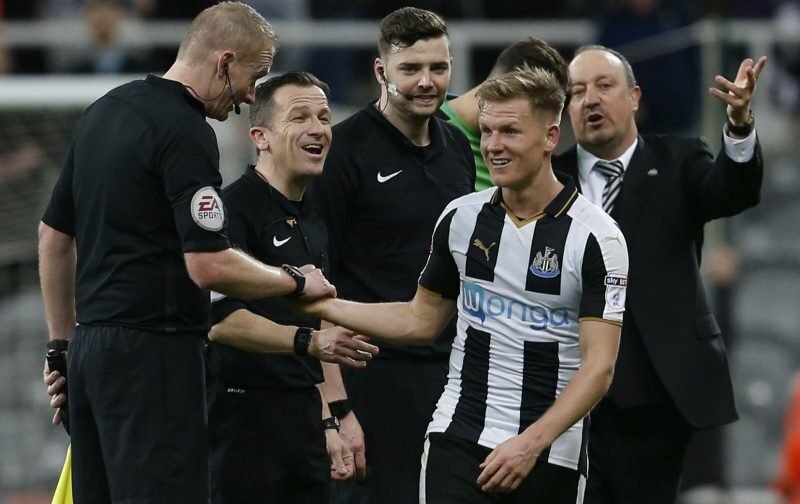 Furthermore, there is a catalogue of errors from this particular official, which have been historically documented and once resulted in a 28-day ban; along with his assistants, after that diabolical decision to not let Matt Ritchie retake a penalty when Dwight Gayle encroached in the box. You may be a Town fan, and you may referee games but to defend this guy, is quite simply a fools’ errand. The disallowed goal I was referring to in my first post was Murphy’s goal . Yes you’re right the referee can overrule the linesman but he was not going to on Murphy’s goal when he would have felt the linesman would have had a much better view of it when he looking across the line. Not saying that Stroud maybe holding something against us (Denying us a corner kick at the death doesnt help his case) but sorry that i disagree with you on my points above but thats how i feel.